About a month back I was intrigued by a "promising" radio commercial about a new business in my region: Batteries Plus. The radio commercial offered 60 watt 'equivalent' LED light bulbs for $40 with a locally (County sponsored) $20 rebate and a $10 Batteries Plus instant rebate. 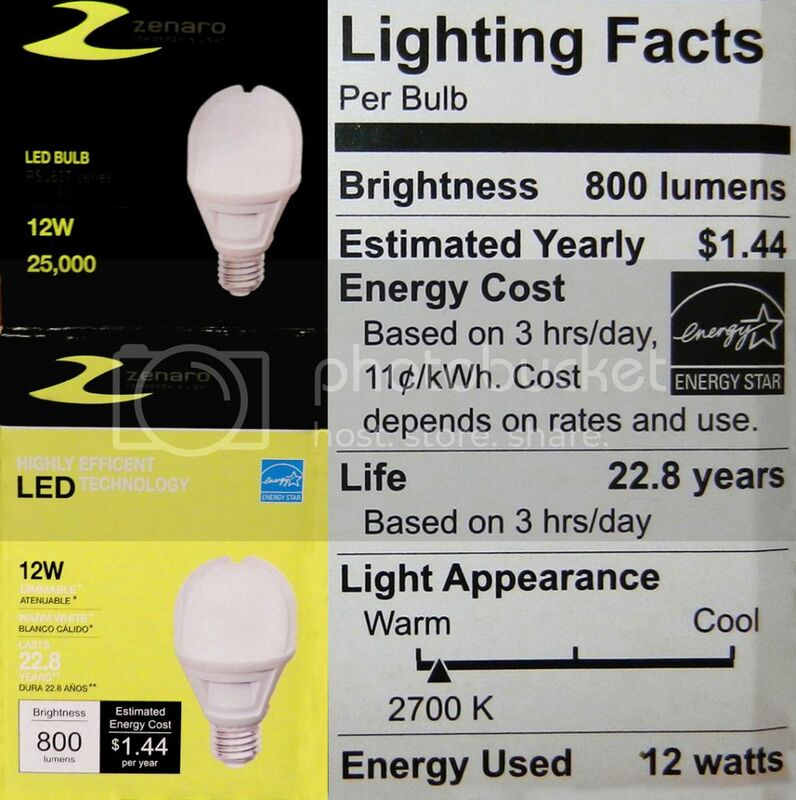 Ten bucks for a 60 watt (equivalent light output) LED bulb that is claimed to last almost 23 years @ 3 hours use per day or almost 3 years of life if it is on 24/7 and it consumes only 12 watts or 1/5th of the electricity of a standard 60 watt bulb ... I had to try one! I have a 1940s brass and glass office desk lamp and it still has its original brass-contact pull-chain socket. The unit is marked "40 watts maximum" and using the 'proper' 40 watt Edison (filament) light bulb, the glass dome has always been almost hot enough to cook an egg but the light output has never been bright enough to be a good desk lamp. Its design had to contribute to the original "War Of The Worlds" movie ... pretty cool looking, but not very functional. Above is a comparative photo of a 12 watt (60 watt equivalent) bulb versus a 40 watt incandescent bulb. The result was 50% more light and less than 1/3 of the power consumption. The 'color' of the '60 watt' LED light is quite warm and less yellow (it should be) than a 40 watt filament bulb and it is nothing like the inhuman purplish hues CFL (compact fluorescent) bulbs create. It consumes less energy than a CFL, it lasts longer and it has no poisonous mercury to worry about. I am impressed. I have been an advocate of LED technology since I first saw them used in a 4-function calculator in 1972 and the technology is quickly maturing. I have used two 3-element C7 equivalent bulbs as night lights for years and each draws about 1 watt rather than 4.5 or 7 watts. My 1950s 'beer-fridge' has a 4 watt LED lamp and as you can see, it works great. I had a long conversation with the Batteries Plus representative and he said 100 watt (equivalent) bulbs are currently available, but they will not carry them until they have achieved a track-record for their dependability. Assuming they do, they will be offered next Spring or early next summer. I like their ethics and I hope you consider buying an LED Christmas gift for your home.